Bisquick has now been on the market for so many years. Part of the Betty Crocker family. It seems that I am always at the grocery store. Not very good at planning ahead. Never know what I want for dinner. So, there I was going up and down the isles, at Publix in Florida, when the new Gluten Free Bisquick caught my attention. When had it come out? I had not seen it at my other favorite store, in Rehoboth, Giant. Immediately grabbed a couple of boxes. Could not wait to try it. Admit it, even if you make everything from scratch most of the time, Bisquick, has been a saviour through the years. Once again, the Gluten Free Bisquick promises great strawberry shortcakes, pancakes, dumplings, groud beef pies, fried chicken….endless recipes. I can keep going on and on. The original Bisquick is still there doing its thing. If you don’t have celiac disease or gluten intolerances, then keep on using it. 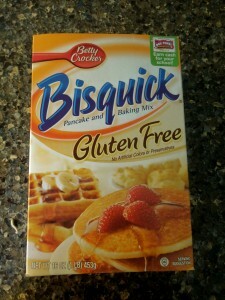 But, if you do have these health issues, the Gluten Free Bisquick is a good alternative for those other recipes. The original Bisquick’s main ingredient is wheat flour. The Gluten Free Bisquick’s main ingredient is rice flour. Their website is http://www.bettycrocker.com/products/bisquick/glutenfree. 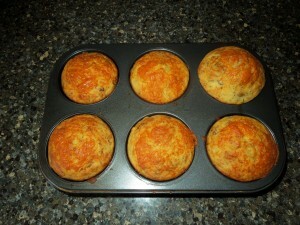 I decided to make breakfast muffins. Don’t have a recipe since I just started adding a little bit of this and a little bit of that. In a frying pan sautee all of the above and put it aside to cool off. In a bowl mix the following. Remember that I don’t have exact measurements. Just wing it. Whisk all of the above and if you need to add more milk, do so. Then, add the cooled sausage mixture and blend it in. 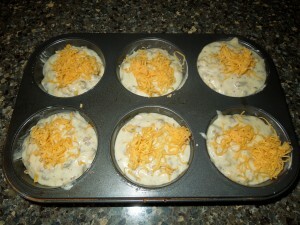 Add to that mixture about 1/2 cup of extra sharp cheddar cheese, or your favorite one. Grease and fill a large muffin cup baking pan pretty much all the way to the top. You want your muffins to have a presence. If you so desire, you can even sprinkle some more cheese on top. Bake for about 20 minutes or so. Insert a knife to make sure they are done; if they need more time, you know what you need to do, put them back in for a few more minutes. 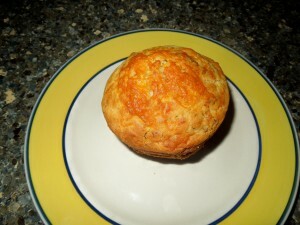 Review: My family loved them; a meal in itself with great combinations of flavors. I am still playing with the mixture. Adding jalapenos, olives? Note: Giant in Rehoboth Beach, Delaware, does not have it, but I have requested it. Will have to check the other grocery stores in the area. Will let you know. Update: I told you I would let you know when Giant would have it on their shelves. They do now. So, go get it. It is pretty good. 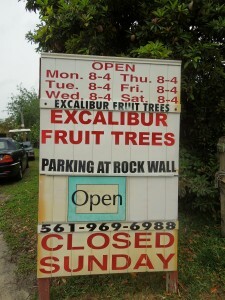 A little road trip took me from Delray en route to Excalibur Fruit Trees, located at 5100 Fearnley Rd., Lake Worth, FL 33467. Tel. 561-969-6988. Website? 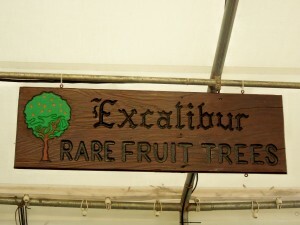 www.excaliburfruittrees.com. From Delray Beach all you have to do is get off on the Lantana Exit, then, go west until you pass the intersection of Jog Rd. Next road, which is Fearnley, take a right and go all the way to the end. Excalibur is on the left hand side. Park by the rock wall on the right. Got it? Pretty easy. This fruit tree farm surprised and amazed me, at the same time. I did not know what to expect when a landscaping company in Delray sent me to them. I was really looking for a fig tree for my neighbor, Felix, who loves them. I have a huge tree in Delaware but to tell you the truth I had not seen them, here, in Florida. Seems to me that it would be the perfect climate. 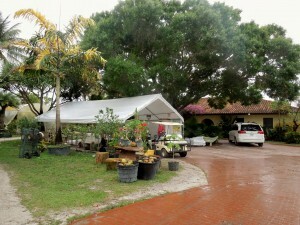 Last Saturday was a little rainy in South Florida, but that did not stop my quest for the fig tree. Richard and Linda Wilson also live on this farm. Linda told me that the farm has been around for about 35 years. They, themselves, have known each other since school. Richard is a 5th generation and Linda is a 4th generation. The farm is huge. 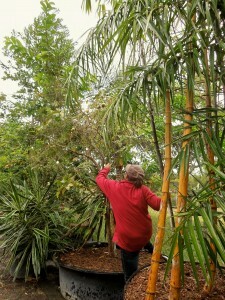 You will find ornamentals, orchids, palms, and so many rare fruit trees. It opens Mondays through Saturdays. They close on Sundays. I jumped with my driver in a golf cart. She and I spoke Spanish. I am sorry to say I did not get her name. She knew the farm well and has worked there for years. As we were going through the different isles of this farm, she stopped when I asked her if they had guava, or guayaba in Spanish. I used to pick this fruit from trees in Puerto Rico. 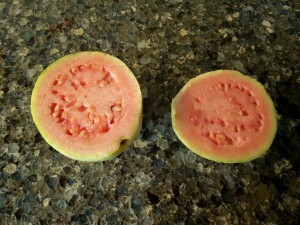 My great grandmother used to make what they called “casquitos de guayaba”, which were the shells of the guava in syrup. This fruit has practically disappeared from Puerto Rico. I think they are proned to worms. The one that she picked at the farm was resistance to worms. Even though it looked green, fooling the worms, it was ripe. As I bit into it, tons of childhood memories came afloat. Sapodilla was the next fruit she picked for me to try. I did not know, at first, what it was. The first thing I recognized was the 3 seeds it had. They looked like black beans. As I bit into it, I remember that it Puerto Rico this fruit is called Nispero, and one of my mother’s favorite. So sweet. 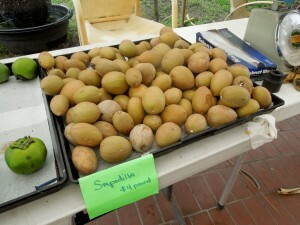 Sapodilla is native to southern Mexico, Central America and the Caribbean. The fruit looks like a potato, inside it is pale yellow to earthy brown. It will not ripen until it is picked. 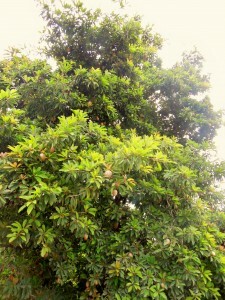 The tree is tall and it bears fruit about four times a year. Another stop and there were the fig trees. In Delaware, my fig tree bears fruit towards the end of the summer when it is nice and hot. I get about 600 figs. Then, all leaves will fall during the winter. 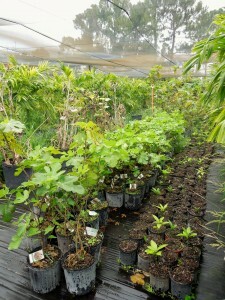 In Florida, they way to deal with a fig tree is plant it now. 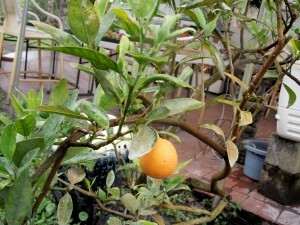 Let it bear fruit during the summer and next February pruned about 3 inches or so. The tree will look ugly. You might even think is dying. Your friends will laugh at your green thumb. Don’t despair; it is going through a process. If by any chance it develops brown spots during the summer, please call your local landscaping company, or check Excalibur’s website for what you need to do. My driver gave me 2 red fruits. 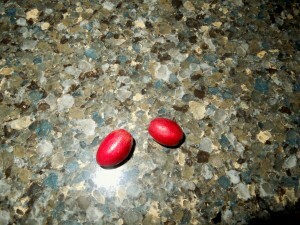 They were small and called the Miracle Fruit. It is native to west Africa. It is a sweetness inducer when it comes in contact with acids, bitter, and sour foods. Foods will then taste as sweet as candy. You are supposed to put them in your mouth, chew for a minute or two, swirling it around, then swallow it. This alternate state will last 1/2 hour to 2 hours. This fruit is used in the preparation of food for people that are sick, making their foods taste better in a natural way. More info? 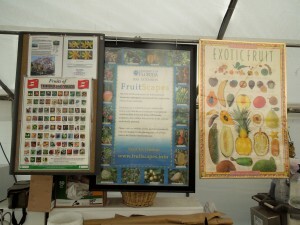 visit http://www.miraclefruitusa.com. 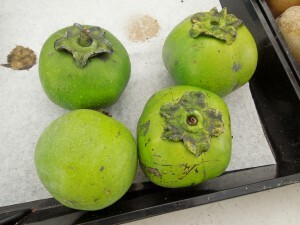 The Black Sapote or Black Persimmon was so interesting. The fruit is green on the outside; the fruit flesh is rich and dark brown in color. Almost custard like. Sometimes it is called the Chocolate Pudding Fruit. The outside gets darker and softer as the fruit ripens. It is a native fruit from Mexico and Guatemala. Cultivated here, in Florida, the Philippines, Dominic an Republic, Cuba, and Hawaii. Full of calcium it can be blended with milk, cream or ice cream. There is a sweetness to it and people use it to make brownies or ice cream. No caffeine or calories!! Then, I saw the little yellowish fruit. I thought it was an orange, but it turned out that it was a red lime. Before Florida widely cultivated limes, red limes were commonly used. Good in cranberry sauce, chutney, and marmalade. The juice is also used in gelatin dishes and custard or chiffon pie. I enjoyed the trip and could have stayed longer. After talking to Linda for a little bit, it was time to go. I paid and off I went to take Felix his new fig tree. They were coming for drinks. A surprise!! Talk to you later….have a good one!! Today was even better than yesterday; one awesome day. And, also the perfect day to meet someone new. I knew her from Facebook, our sons are good friends, but we just had never met. Boston’s would be the place, right by the beach. Boston’s is an institution in Delray Beach. It is located at 40 S. Ocean Blvd. Tel. 561-2778-3364. Website? 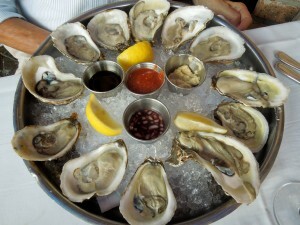 www.bostonsonthebeach.com. First thing I noticed was that the Tiki Bar is up and running. It is called The Sandbar. Apparently not too much to eat; plenty to drink, though. 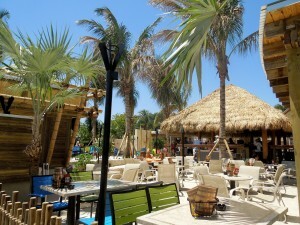 Sit outdoors or at the bar under the tiki hut. Waiting for Chris I noticed those “golf carts” again. These guys were game for a Nikon moment. 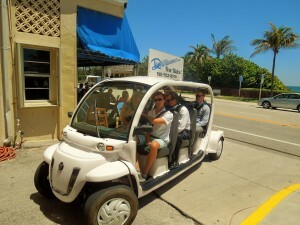 Okay, it is called Delray Downtowner. Free rides on demand!! 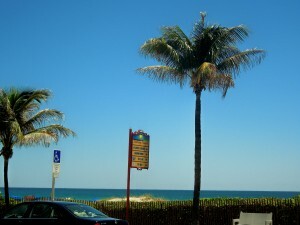 Anywhere in the downtown area and neighborhoods in Delray Beach. Wave them down or call them up at 561-702-8519. Visit their website, www.delraydowntowner.com. Hugs for a new friend and right on the sidewalk was the perfect table to catch up. We talked and talked and ate our salads. 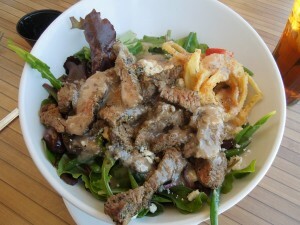 I had a steak salad, which was very good. It is funny because as much as I usually talk about food, this time was pretty much about us, 2 new friends getting acquainted. Chris reminded me of my friend Shelley. She asked for her chicken salad, but hold the olives, substitute the cheeses, etc. etc. Funny!! She was also pretty happy with her salad. After a few hours, we had to go. But, we will meet again. Note: Chris’ business is Elegant Orchid Arrangements. She specializes in customized floral arrangements. You can call her at 561-654-4605 or 561-330-2974. E-mail her with questions to Orchid11251@aol.com. It really was a gorgeous day. A totally blue sky. Where was all that noise coming from? There she was. 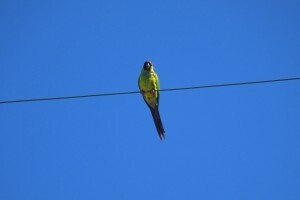 One of those Florida green parrots. Great afternoon…talk to you later. With such a gorgeous South Florida day, who wants to be indoors, or eat indoors, when you have so many restaurants in Delray, that offer al fresco dining? 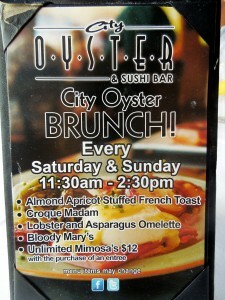 We picked City Oyster because of its consistency; a dependable restaurant, offering a relaxed dining atmosphere. 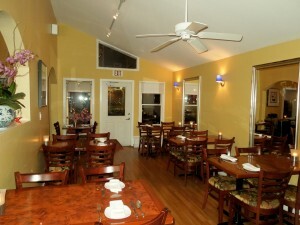 It was one of the restaurants that we first visited when we arrived in Delray years ago. Lunch, dinner or a drink at the bar, your pick. For us, it was lunch. 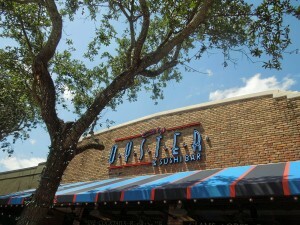 City Oyster is part of the group of restaurants owned by the Big Time Restaurant Group. It is located at 213 E. Atlantic Ave. Tel. 561-272-0220. Website? 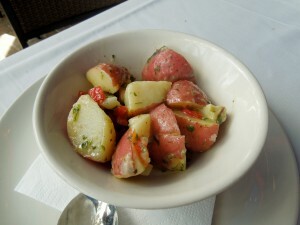 www.bigtimerestaurants.com. It is open for lunch Monday through Saturday from 11:30 to 2:30 p.m.
Sunday, 5 until 10 p.m.
Monday, Tuesday, and Wednesday, they start serving dinner at 5 until 10 p.m.
Thursday, Friday, and Saturday, dinner will start at 5 until 11 p.m.
On Saturday and Sunday City Oyster offers a brunch from 11:30 until 2:30 p.m. 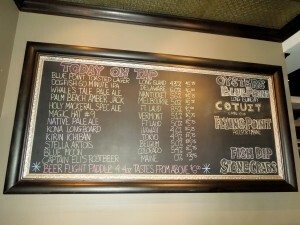 I was delighted to see today on their chalk board, Dogfish 60 Minute IPA, our own Delaware beer. The board will show the Daily Beers on Tap, as well as a list of the oysters available for the day; other daily seafood too. The bar runs the length of the restaurant. Today everyone was sitting outside. The tables were closely assembled. As we waited for wine, which by the way it took a little longer than it should have, the gentleman on one side was choking (he got the help needed), on another side the guy sent his food back but then it looked like the same food came back. Go figure. And, the young woman that was savoring her fish tacos started to quietly cry. It was not the food, I know that. I think she got sentimental. The guy with her seemed very nice. Didn’t I tell you the tables were closely assembled? 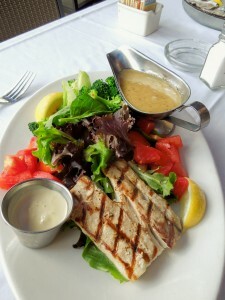 Thank God our food came out and my attention was directed to my Grilled Mahi Mahi, which was the fish of the day, on a French garden salad. Tomatoes, broccoli, shallots, Mesclum with homemade aioli and a mustard vinaigrette. It was delicious and I really loved the fish. My husband decided on Blue Point oysters and a side order of Red Bliss Potato Salad. That was it!! No other excitement or drama…. What’s Going On? Ocean City, Maryland, Activities, Events, The Heart of the Town? The Ocean!! I think visitors that travel to Ocean City, Maryland go to this seaside resort for its beaches. The main attraction is the wide beaches, but Ocean City has such an interesting past. In the old days, when nothing was developed, Ocean City’s visitors came just to enjoy the beach, fish and to collect shells. The first ocean front inn was built in 1869. After that, the town was surveyed and 250 beachfront lots were developed. The corporation that was formed to develop the land sold 4,000 shares of stock at $25 each. “Ocean City, at this time, was known as the “ladies resort to the ocean”. 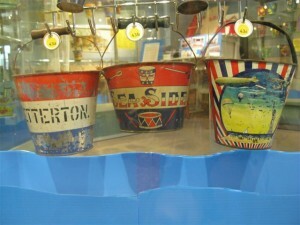 You can read a brief history of OC by visiting http://www.oceancity.com/content/blog/brief-history-ocean-city-maryland. Ocean City is know for its famous Boardwalk that stretches for many blocks; and its status as the White Marlin Capital of the World. Thursday, 4/26 – Saturday, 4/28 – A Feeble Mind by up-and-coming Boston playwright, Mark Mazzenga is being presented by Brown Box Theatre Project and directed by Ocean City’s own, Kyler Taustin. A Feeble Mind is a tense, voyeuristic look at the struggling marriage between a 50’s era eugenics proponent and his virtuous young wife. Today, the United States eugenics movement is still at the forefront of the news, as seen recently in CNN’s story of the legal action being taken by victims of sterilization in California. Mazzenga’s play sheds new light on the issue through his examination of hypocrisy, morality, and affection. The Captain’s Table Restaurant in Ocean City, will host Brown Box’s production. Tickets can be purchased online through www.brownboxtheatre.org. Thursday, 4/26 – Sunday, 4/29 – The 2nd Annual Bikes to the Beach Spring Rally – Hotels, nightclubs, and restaurants will be participating in this Spring Rally. There will be bike builders, entertainment, vending and plenty more. For more info., please visit www.bikestothebeach.com. The event will take place at 12913 Ocean Gateway. Tel. 407-721-9110. Friday, 4/27 – Sunday, 4/29 – The 42nd Ward World Championship Wildfowl Carving Competition and Art Festival, 4001 Coastal Highway. Tel. 410-742-4988, Ext. 114. Website? http://www.wardmuseum.org. Or, e-mail wardevents@salisbury.edu. The Ward Museum of Wildfowl Art, and Salisbury University host the 42nd Annual Ward World Championship Wildfowl Carving Competition and Art Festival at the Roland E. Powell Convention Center. View world class bird carvings and sculptures, bid on art at the benefit auction at 3 p.m. on Saturday, shop at over 100 exhibitor booths, and enjoy the many activities for kids at the Kids Corner. This is the most prestigious competition of contemporary wildfowl art. Admission: Multi-day pass $18, One Day Adult is $10, Students One Day is $8, Children 12 and under Free. Hours: Friday 10 to 5 p.m., Saturday, 9 to 5 p.m., and Sunday, 10 to 4 p.m.
New for this year will be raptor demonstrations by Brian Bradley of Skyhunters in Flight and a showcase of works by Society for Animal Artists. Friday, 4/27 – Sunday 4/29 – Maryland International Kite Expo 2012, at Boardwalk 1st Street to 6th Street – Tel. Jay Knerr at 410-289-7855. Website? http://www.kiteloft.com. This is a great spectator and participant event. The 3 day event will feature fun filled days of kite flying on the beautiful beaches of Ocean City, Maryland. Exhibitions, competitions, stunts and power kite lessons. Free children’s games and activities. The festival will showcase some of the best kite flyers from around the world. Kites of all shapes and sizes will be on display including some massive character and theme based kites. It is free to the public….”Go Fly a Kite”. Saturday, 4/28 – Board Walkin’ for Pets – The Worcester County Humane Society Annual Fun Event is a Walk-a-Thon on the boards!! All proceeds benefit the Ocean City area’s no-kill pet shelter. Bring your pet for a fun day on the Boards to help the animals or adopt a shelter dog for the day by making arrangments prior to the walk-a-thon. There is a registration fee. 9 a.m. to Noon, rain or shine. Please call 410-213-0146. Location? Inlet at the South End. Website? http://www.boardwalkinforpets.com. Saturday, 4/28 – Ocean City MD Half Marathon/5K Event – Race starts at 7 a.m. at the Ocean City Inlet Parking Lot. Registration Fee for participants. Please call Chris Klebe at 443-493-4324 or visit www.octrirunning.com. You may also e-mail info@octrirunning.com. SAVE THE DATE: Springfest, in Ocean City, Maryland, will be celebrating its 22 year!! It takes place at the Inlet Parking Lot. May 3rd until May 6th. Website? http://oceancitymd.gov/recreation_and_Parks/specialevents.html. Springfest 2012 celebrates spring and the upcoming summer season. Live Entertainment, arts, crafts, and, of course, plenty of food!! Just one mile long, 3 blocks wide. 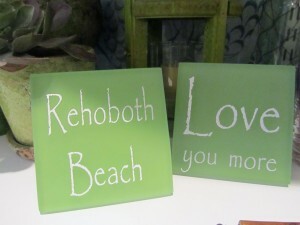 On the east, is the Atlantic Ocean; on the west, is Rehoboth Bay. Coastal Highway or Rt. 1 separates the two. Water sports aficionados, this is your town. And, party-goers? You already know what this town is all about; music venues, bars, restaurants, entertainment. 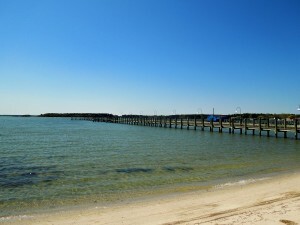 Dewey Beach was incorporated in 1981. Accolade like “Superstar Beach” by the Natural Resource Defense Council has given Dewey this award for its perfect water quality ratings. Even with all the partying that goes on at night, Dewey, is also a family town. During the summer, movies on the beach and other activities; a tot lot and a gorgeous beach. It is a playground for all; a well balanced act. As warmer temperatures hit the Delaware Beaches, this town of only a few hundreds in the winter, will find thousands of visitors this summer. New this year…The town of Dewey Beach is proud to offer the 2012 Lifeguard Chair and Umbrella Sponsorship Program. This program is open to property owners and businesses within Dewey Beach only. The cost of sponsorship is $1,000 for the 2012 season. This will include, both, a plaque attached to the back of a Dewey Beach Lifeguard chair and an umbrella with the name or logo of the sponsor printed on one panel. All logos must be approved by the Dewey Beach Marketing Committee. No endorsements of products or specials are allowed. With only 17 chairs available, it will be on a “first come” and “first paid” basis, along with a completed and approved application. The sponsorship sale starts on Saturday, May 5th. 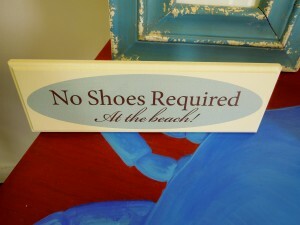 For more information, please visit www.townofdeweybeach.com. Click on the heading that says “The Town of Dewey Beach is Proud….”. You can download an application and read more about this new program in Dewey. You can also contact Gary Keith at gary4dewey@yahoo.com. 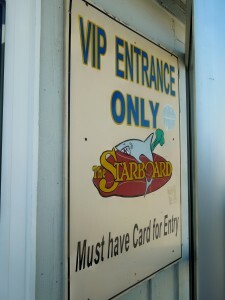 So, if you are a habitual visitor to Dewey and to The Starboard, then you better get your VIP card. Avoid those lines to get into one of the most popular restaurants/bars in Dewey. 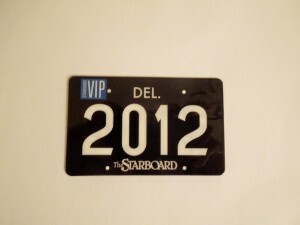 This card has been available for years….it’s just that the 2012 is just like the antique Delaware Tag. The Starboard affords its patrons everything. Breakfast, lunch, late night bites. It has the best Bloody Mary Bar on the beach, with 18 brands of Vodka. Please check their website for upcoming events by visiting www.thestarboard.com. 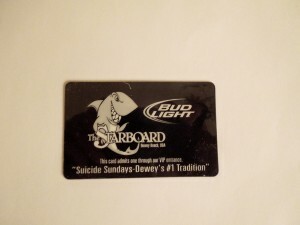 If you want to check what’s on the menu for breakfast, then visit www.thestarboard.com/dewey-beach-de-menus/Breakfast. 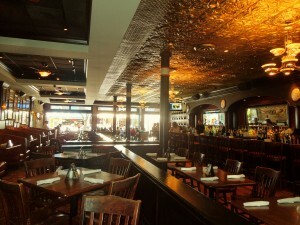 For lunch, visit www.thestarboard.com/dewey-beach-de-menus/Lunch. And, for late night bites, which are served from 10 p.m. until 1 a.m., visit www.thestarboard.com/dewey-beach-de-menus/Late-night. 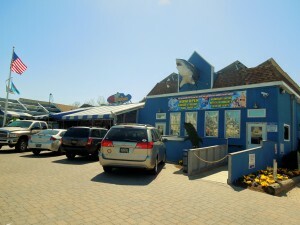 The Starboard is located at 2009 Highway 1 (Coastal Highway), Dewey Beach. Tel. 302-227-4600. 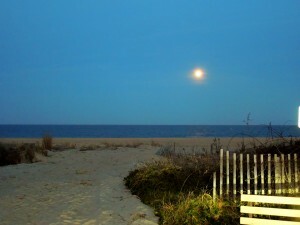 And, please remember than on full moon nights, there is no better place to see the moon than in Dewey Beach!! 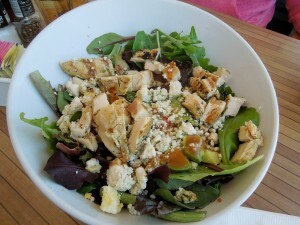 When visiting Rehoboth Beach you will find that there are so many dining choices. You might want to try Confucius. 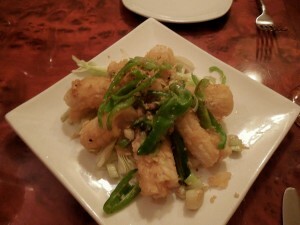 It is a Chinese restaurant located at 57 Wilmington Avenue in Downtown Rehoboth Beach. Tel. 302-227-3848. Website? 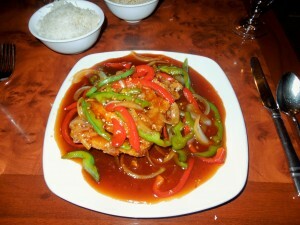 www.confuciusrehobothbeach.com. They open from 5 to 10 p.m. and on Sundays they do have a brunch. 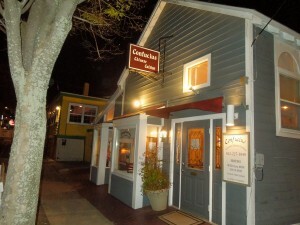 The Sunday hours are 11 until 10 p.m.
Confucius entered the Rehoboth Beach dining scene in 2004. The building is quaint; the inside, comfortable, warm and welcoming. But, wait until you meet Shawn and Danielle Xiong. They are the owners and operators of Confucius, along with their staff. They are all so friendly and have made Confucius a locals’ favorite. I told Danielle the other night that Confucius was my favorite Chinese restaurant. And I meant it. The restaurant offers superior food quality. Fine dining comes to mind, with reasonable prices. A wonderful wine list for the wine aficionado is also available. Confucius is very aware of gluten allergies. We can eat with total ease knowing that we will be taken care of. It was a quiet night in Rehoboth Beach, when we stopped in. Confucius had a few customers, but it was also later than usual when we arrived. We first ordered the Salt and Pepper Calamari. This dish had a nice kick to it. The calamari was soft; not chewy. 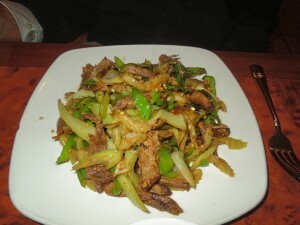 An order of Five Spiced Duck, which had shredded duck meat with celery and fresh hot peppers and cilantro. It is quite spicy, but that’s how we like it. And an order of Crispy Rockfish Filet with a mild spicy honey vinegar sauce. Rockfish is being caught at this time of the year. I truly loved this dish. The Rockfish was very lightly fried and the sauce was just excellent. That’s all we had and we were more than satisfied. No dessert for us on that evening. And, I do mean it….Confucius is my favorite Chinese restaurant.